IBPS released admit card for RRB Office Assistant (Multipurpose) mains exam 2018. Exam is scheduled on 07th of October 2018 . Institute of Banking Personnel Selection(IBPS) has released admit card for RRB Office Assistant (Clerk) mains exam 2018. Candidate who qualified in Prelims exam can download admit card for Mains exam. 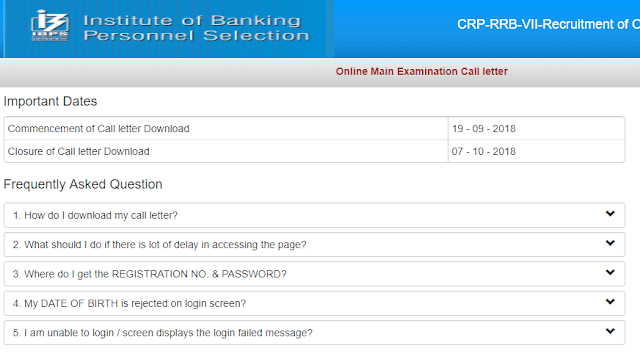 Link for admit card of IBPS RRB Office Assistant mains exam provided below. Exam for IBPS RRB Office Assistant (Multipurpose)is scheduled on 07th October 2017 (Sunday). IBPS has already released Admit card for RRB Officer Scale I, II and III exam. To Download admit card for RRB Office Assistant (Multipurpose) mains exam 2018, click on the link given below, an external window of official website of IBPS open, now provide your Registration Number and Password and then fill captcha image text in provided box.